The Warwickshire town of Royal Leamington Spa has been ranked the happiest place to live in Britain, in a survey which saw several spa towns make the list. Harrogate, Royal Tunbridge Wells and Epsom also featured in the top 10 "happy at home" index compiled by property website, Rightmove. Meanwhile Llandrindod Wells was deemed the happiest place to live in Wales. Spa towns have natural springs with waters thought to have health benefits. Is Leamington Spa really that happy? There are spa towns all across England and Wales - including Cheltenham and Bath which came in 29th and 38th place in terms of happiness rating. Dumfries was identified as the happiest place to live in Scotland. Where can I afford to live? Is Dumfries the happiest place in Scotland? Where is the best place to be a woman in Britain? More than 17,000 people were asked how happy they are with aspects of where they live. Community spirit, feeling safe, the friendliness of locals, the amenities and local services available and earning enough to live comfortably were all taken into account. 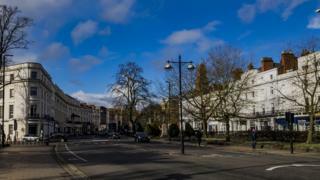 Rightmove said Royal Leamington Spa scored highly for friendly neighbours and a strong sense of belonging. But happiness comes with a price, with the average asking price of a home in Leamington Spa at £330,848, compared with a national average of £310,003, according to Rightmove. The town's mayor, Caroline Evetts, said Royal Leamington Spa "has it all" - from Regency buildings, to independent boutiques. Last year's winner, Leigh-On-Sea, Essex, took the runner-up spot in this year's survey. Is Royal Leamington Spa really the UK's happiest town? House price calculator: Where can I afford to rent or buy?